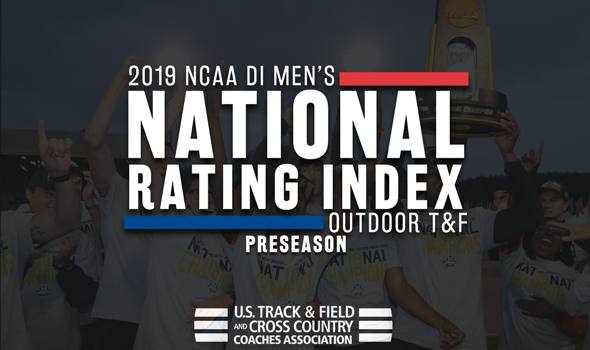 NEW ORLEANS – There won’t be a changing of the guard – at least for now – atop the NCAA Division I Men’s Track & Field Rating Index now that we remove the roof and add a few events to the ledger. That’s because Texas Tech – the team that was ranked No. 1 throughout the indoor season – begins the outdoor season in the same spot. The Red Raiders received their first outdoor No. 1 billing in program history when the Preseason TFRI was released on Monday by the U.S. Track & Field and Cross Country Coaches Association (USTFCCCA). A trio of SEC programs sit No. 2 through No. 4 – Texas A&M, Alabama and Florida, in that order – and BYU rounds out the top-5. Texas Tech finds itself at the top thanks to six marks that are ranked in the top-5 of the TFRI Individual Rankings, which combine previous outdoor bests and the current Descending Order List. Norman Grimes enters the season ranked No. 2 in the 400H at 49.38, while Charles Brown and Odaine Lewis own the No. 2 spots in the long jump and triple jump, respectively. Jah-Nhai Perinchief is ranked third in the high jump, while Lewis and Divine Oduduru are listed fourth in the long jump and 200, respectively. Robert Grant, Tahar Triki and Devin Dixon lead the Aggies into the season. Grant and Triki are ranked No. 1 in the 400H and triple jump, respectively, while Dixon is No. 2 in the 800. Grant and Triki recorded both of their top marks at the SEC Championships last year. Texas A&M has been ranked No. 2 in the Preseason TFRI in three of the past four years. The Crimson Tide is looking for big things from Alfred Chelanga, Gilbert Kigen and Vincent Kiprop, as well as Kord Ferguson. Chelanga, Kigen and Kiprop all have spots in the top-5 of the TFRI Individual Rankings in the 10,000 (Kiprop is also listed in the 5000), while Ferguson is in the top-10 of both the shot put and discus throw. You can’t forget about Shelby McEwen either, who just captured the indoor title in the high jump. This is the highest that Alabama has been ranked in the preseason in program history. Grant Holloway is expected to lead the Gators during the outdoor season, just as he did indoors. Holloway, who scored 27.5 points at the indoor meet two weeks ago, is ranked No. 1 in both the 110H and long jump. Other top-5 marks for Florida include Anders Eriksson in the hammer throw and Clayton Brown in the triple jump. The Gators started the 2018 season ranked No. 4 and quickly moved to No. 1, where they stayed the remainder of the campaign. The Cougars have never been ranked in the top-5 until now. BYU is hoping for big points in Austin, Texas, from Rory Linkletter, Connor McMillan and Clayton Young. Each of those three men is listed in the top-10 of the 5000 and 10,000. Clayson Shumway is also a scoring threat in the steeplechase. No. 6 Houston, No. 7 Oregon, No. 8 Texas, No. 9 LSU and No. 10 Georgia round out the top-10. Be sure to check back throughout the season as the TFRI will shift ahead of the 2019 NCAA Division I Outdoor Track & Field Championships set to begin June 5 in Austin, Texas.